Since 1967, JASCO has also been manufacturing polarimeters. In 2007 the P-2000 series instruments were introduced. During the designing process of the P-2000 polarimeter, beside the more convenient handling, also the easier extensibility for the different user’s tasks was taken into consideration. In order to fulfill the users’ requirements as completely as possible, instruments fitted with sodium (Na), mercury and halogen lamps are offered. Two lamps can be placed in the unit house at the same time. Both of them can be selected by the software with the help of a light source switching mirror. In addition to the use of manual filters with polarimeters with mercury and halogen lamps, optionally, an automated filter changer with 8 filters is also available. The diameter of the light beam can be varied according to the diameter of the applied cell (aperture: 1,8mm, 3 mm and 8 mm for the cells with inner diameter: 2,5 mm, 3,5 mm and 10 mm). After setting the measurement parameters it is easy to carry out series of measurements with the help of the Start button placed on the instrument. The samples can be kept at the constant temperature chosen by the user with the help of water jacket cells or the Peltier thermostatted cuvette holders. The measurement of a large number of samples can be accelerated with the use of sippers. The unit control can be done either with the Spectra Manager II software package – capable of controlling all the JASCO spectroscopy instruments – or with the iRM control unit. 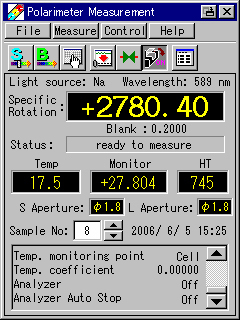 readout modes: optical rotation (α), specific rotation ([α]), optical purity, concentration, sugar scale, Brix scale. accuracy with Na-lamp: 1° ± 0.002°, over 1° 0.2%. The Spectra Manager II software package that carries out the PC control of polarimeters and the collection of the measured data, allows not only the measurement of the rotation but also the measurement of its temporal variation. The measured data can be displayed in units of α, [α], Brix, sugar, concentration and optical purity. Due to the validation program module as part of the basic software package, the regular monitoring of the instrument can be performed easily by the user and the results can be printed and stored electronically. For the pharmaceutical industry the 21 CFR part 11 compliant version, which allows the use of multi-level user permissions, is also available. The iRM (intelligent Remote Module) control unit equipped with a color touch-screen display allows the PC-free control of polarimeters. It permits the measurements and the display of the measured data in units of α, [α], Brix, sugar, concentration and optical purity on a clear and easy-to-use interface. Due to the validation program module, the regular monitoring of the instrument – capable of producing a written record – can be performed easily by the user. With the directly connected printer the measured data and the calculated statistics can be automatically printed after the completion of the measurements. The data is stored on a memory card and it can be saved for archival purposes to the PC via the card reader shipped with the instrument. Due to its built-in water tubes, the standard cell compartment of the JASCO P-2000 polarimeter is capable of holding water-jacketed cells with a maximum length of 10 cm. With the use of Peltier-type cell holders, the temperature of the samples can be controlled from the software and in the case of a large number of samples, the use of sippers may prove useful. If the extension of the wavelength range of 350 – 650 nm used in the standard instrument is necessary, it can be expanded to 250-880 nm due to the so called “low-UV” option. Low-UV wavelength extension, includes Glan-Taylor polariser, quartz Faraday cell, wide range (250 – 880 nm) photomultiplier tube (PMT).